Interested in becoming a certified Geri-Fit instructor or need CEUs? 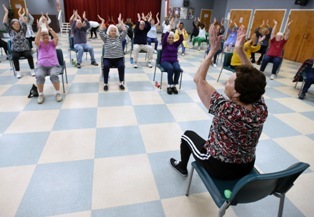 Attention Fitness Instructors, Nurses and CDSME Facilitators as well as Community Volunteers: We're looking for qualified instructors to teach Geri-Fit classes at licensed senior centers, libraries, and other facilities throughout the U.S. If you'd like us to refer you to one of our licensed sites, please complete our Instructor Registry. Your information will not be used for any other purpose other than placing you at or referring you to a licensed facility that is near to where you live. We are also looking for instructors that teach yoga, tai chi, fall prevention classes, and diabetes self-management courses, so please include that information on the form if it pertains to you. If you are an energetic, team-minded person that is passionate about health and wellness, and you enjoy teaching and helping older adults meet their health and fitness goals, then we've got some great training courses for you! We offer online training courses and live, Master Trainer-led courses for fitness instructors, nurses, in-home health aides, caregivers or anyone who's interested in learning evidence-based strength training exercises for fall prevention and chronic disease management. Click on the links above to learn more about our courses whether taken online or in-person. In the meantime, read more about the Geri-Fit program! Geri-Fit® is a tier III (highest level) evidence-based health promotion program and chronic disease self-management support program. There's no aerobics, dancing, choreography, or floorwork to learn. Most of the exercises are performed seated in chairs with dumbbell weights ranging in size from 2 to 5 pounds. Photo credit: Star News Media - used with permission. The Geri-Fit program can accommodate any age and fitness level, from age 60 to 99, as each person is encouraged to work out at their own pace. Having a stronger body means better balance which translates into fewer falls and fewer trips to the hospital. In addition, strength training exercises will help manage chronic diseases such as diabetes, high blood pressure, heart disease, arthritis, depression, pain and more. 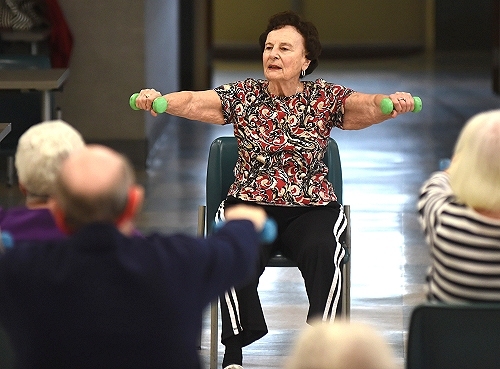 Our proven methods of combining strength training, balance training, and proprioception exercises will help turn back the hands of time and improve the quality of life for older adults. Become certified today and help others live a long and healthy life through Geri-Fit! Geri-Fit's courses are approved by NSCA, ACE, NCCAP: approval numbers 32118-19 and 500242-19NT; and the California Department of Social Services (CDSS) for RCFEs, GHs, and ARFs that require contact hours for continued education licensing requirements, vendor approval number 2000509-740-2.